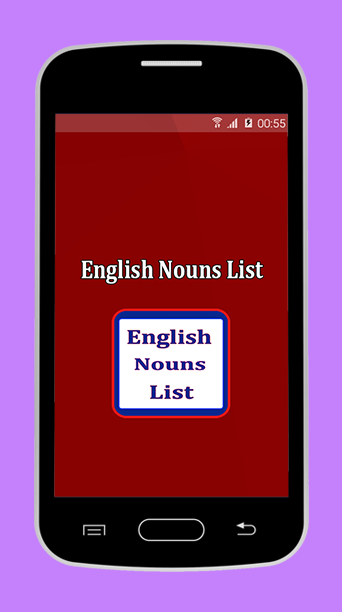 english list nouns is app for the children are beginner to readiseffective in making teaching very easy the nouns is first partofspeech that children learn when they begin to read Usethefollowing the most list of nouns in english the app is for eachagegroup to help your child the list nouns for english beginnerforlearn about the ideas things people and places that surroundthem.features: -list of nouns in english -list nouns for all ages-nounsfor the reading and speech -english nouns dictionary listlearnenglish nouns the app for each age groupe. Easy english Conversations for the students to learn speak englishand to improve english skills for speak very fluently the appincludes list of conversation includes the most words and pharasesfor learn speak english very easy. English Conversation Topics:English conversation about the Books English conversation about theTravel English conversation in the school English conversation onthe phone English conversation in a restaurant English conversationabout friend English conversation in a hotel English conversationabout the hobbies many conversations for the students to learnenglish and many new words and pharases. Gerunds and infinitives exercises is useful application for anyonewant practice and learn gerund and infinitive. - Exercises totraining of english grammatical rules and to use correctly isinteresting to learning in good way. - Tests for the studentprepared for ESL/EFL to pass exam eassely. - gerund and infinitiveexercises with answers. ☛ download the app and starting trainingand learn from the tests. Suffixes are a letter or group of letters added to the endingofwords to change their meaning or function. Theseuseful,shapeshifting tools can be as small as -s, and -ed, or canbelarger additions such as -ation, and -ious. Recognize rootstheEnglish language will help you to learn the origins of wordsinenglish and build your vocabulary . This prefixes andsuffixescontains the following features: - Prefixes list A-U -Nounsuffixes - Adjective Suffixes - Verb Suffixes - AdverbSuffixesprefixes suffixes and root word is to learn the originswords inenglish languages. Do you love chinese language and want to learn chinese languagethisapp will help you to learn the basic chinese language theappincludes all what will the need to learn in the way veryeasy.chinese basic language includes: • Alphabet • Colors • Monthsofthe year • Days of the week • Numbers • Ordinal numbers •Personalpronouns • Useful words • Holidays • Family • Animals •Time •Weather • Seasons • Directions • Emotions phrases • Clothes•Health • Hobbies • Household appliances • The body • Questionsword• Prepositions • Demonstrative pronouns • Interrogativepronouns •Quantifier • Adverbs of time • Adverbs of place • Adverbsof manner• Transportation • Animals • Fruits • Vegetables **All youwant tolearn chinese languages for beginner is available and free. Vous voulez apprendre la grammaire française cette application vavous aider à améliorer vos compétences grammaticales l'applicationcomprend tout ce qui cherche à améliorer votre niveau dans denombreuses fonctionnalités comme apprendre comment écrire etapprendre un nouveau vocabulaire est vous aider dans laconversation à utiliser pour la communication avec gens.L'application comprend: + Les types de phrases + Les formes dephrases + Les expansions du nom + Le déterminant + La cause + lesprocédés de reprise + Pronom personnel + Le verbe pronominal + L’adjectif qualificatif + Accord du verbe + Accord du participe passé+ Concordance des temps + Subjonctif + La proposition principale +La proposition infinitive + La proposition participiale +Proposition subordonnée + Adverbes de négation + Les articles +Articles définis + Articles indéfinis + Article partitif + Omissionde l'article + Répétition de l'article + Adjectifs démonstratifs +Adjectifs exclamatifs + Adjectifs indéfinis + Adjectifs possessifs+ Adjectifs relatifs + Le nom + Les groupes La caractéristique del'application: + L'application est en mode hors connexion. +Apprenez la grammaire française à partir de votre téléphone. +Leçons avec exemples et explications. You want to learn Frenchgrammar this application will help you improve your grammaticalskills the app includes everything that seeks to improve your levelin many features like learn how to write and learn a new vocabularyis help you in the conversation to use for communication withpeople. The app includes: + Types of sentences + Forms of sentences+ Expansions of the name + The determinant + The cause + recoveryprocesses + Personal pronoun + The verb pronominal + The qualifyingadjective + Agreement of the verb + Past participle agreement +Concordance of times + Subjunctive + The main proposition + Theinfinitive proposition + The participatory proposal + Subordinateproposal + Negative Adverbs + Articles + Articles defined +Indefinite Articles + Partitive article + Missing article +Repetition of the article + Demonstrative adjectives + Exclamatoryadjectives + Indefinite adjectives + Possessive adjectives +Relative adjectives + The name + Groups The feature of theapplication: + The application is offline. + Learn French grammarfrom your phone. + Lessons with examples and explanations.